This biography of Mark Twain (whose given name was Samuel Clemens) for children was excerpted from Mary Stoyell Stimpson's book, A Child's Book of American Biography (1915). Add over one hundred years to Ms. Stimpson's time reference when you read it with your own children. John Clemens, Samuel's father, was a farmer, merchant, and postmaster in a Missouri town, called Florida. His wife, Jane Clemens, was a stirring, busy woman, who liked to get her work out of the way and then have a real frolic. Her husband did not know what it meant to frolic. He was not very well to begin with, and when he had any spare time, he sat by himself figuring away on an invention, year after year. He spent a good deal of time, too, thinking what fine things he would do for his family when he sold a great tract of land in Tennessee. He had bought seventy-five thousand acres of land when he was much younger, for just a few cents an acre, and when that land went up in price, he expected to be pointed out as a millionaire, at least. John Clemens was a good man and something of a scholar, but he was not the least bit merry. His children never saw him laugh once in his whole life! Think of it! "Why—why—" he stammered, "I must have forgotten him." Of course he was ashamed of himself and hurried a man off to Hannibal, on a swift horse, where Sam was found hungry and frightened, wandering through the locked house. After his death Sam learned the printer's trade. He was very quick in setting type and accurate, so that he soon helped his older brother start a newspaper. He worked with his brother until he was eighteen, and then he told his mother that he wanted to start out for himself in the world. Jane Clemens loved him dearly and hated to part with him, but when she saw his heart was set on going, she took up a testament and said: "Well, Sam, you may try it, but I want you to take hold of this book and make me a promise. I want you to repeat after me these words—'I do solemnly swear that I will not throw a card or drink a drop of liquor while I am gone!'" He repeated these words after her, bade her good-by, and went to St. Louis. He meant to travel, and as he earned enough by newspaper work, he visited New York, Philadelphia, and was on his way to South America when he got a chance to be a pilot on the Mississippi River. While he was learning this trade, he was happier than he had ever been in his life. If you want to know what happened to him at this time you must read a book he wrote, Life on the Mississippi River. 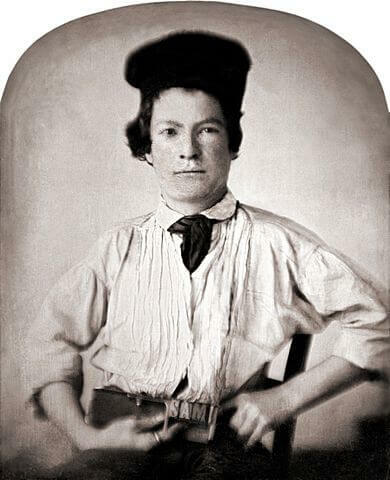 He wrote a great many books and signed whatever he wrote with a queer name—MARK TWAIN. This was an old term used by pilots to show how deep the water is where they throw the lead. His writings, like his boyish compositions, made people laugh. So that now, although he has been dead several years, whenever the name of Mark Twain is mentioned, a smile goes around. If you want to know more about the actual doings of Sam and his chums, Will Bowen and John Briggs, read Tom Sawyer and Huckleberry Finn, for in those books Sam has set down a pretty fair account of their escapades. Mark Twain's (Samuel Clemens') story is featured in our collection, American Biographies for Kids. Visit American History to find out about other important people and their writings which helped shape the country. Add Mark Twain: A Child's Biography to your own personal library.